There are two novels that can change a bookish fourteen-year old's life: The Lord of the Rings and Atlas Shrugged. One is a childish fantasy that often engenders a lifelong obsession with its unbelievable heroes, leading to an emotionally stunted, socially crippled adulthood, unable to deal with the real world. The other, of course, involves orcs. 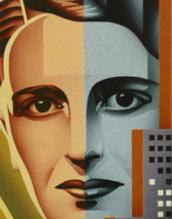 People I otherwise respect in skeptical circles keep saying they like Ayn Rand. Michael Shermer for example, whom as I recall spends an entire chapter of Why People Believe Weird Things shooting her down, nonetheless admires her. Then there was a some chatter on the Ottawa Skeptics forum, with some of my acquaintances there expressing some affection for her. Makes me wonder if she's someone I need to take seriously, or continue to dismiss as an over-rated crank. So I don't think there's any doubt what philosophers' answer would be. Atlas Shrugged is a life changing book. I read it in college (twice actually) and it was exactly for that day and time, even though it was 20 some years afters she wrote it. I'm sure it would have the same impact today. 40 years go by and we are still asking, who is John Gault? I only know very little of her. A fellow atheist posted a chapter from one of her books on a forum, and it was some of the most vhildish immatrure, ignorant drivel I have read, that has had the misfortune to be published. It presumed to describe a socialist society, were everyone got what they needed, and had to give what they could. But the author fucks it up in the second sentence where she describes that the good men had to slave 24/7, while the slackers were pampered - so it seems it wasn't a society where people got according to needs, or gave what they could. It just went downhills from there.